No matter what kind of dog you have if you love to go camping in the colder months and plan on taking your dog with you, remember that all dog breeds can and do get cold so it’s a good idea that you no how to take your dog with you and keep him safe and warm in the cold weather that you both will be camping in. It’s very important that you feed your dog properly when you are camping. When it’s cold your dog is going to need a lot of extra calories to help him stay warmer. So you will need to make sure that the meals you give him are larger than if you were feeding him at home and also make sure to supplement his camping diet with a lot of extra snacks that are high in proteins. You need to make sure that he gets plenty of water. Water can be hard to find when you are camping during the colder months and this dry and cold weather more than likely will make your dog very thirsty so take a lot of extra water along with you especially for your dog. 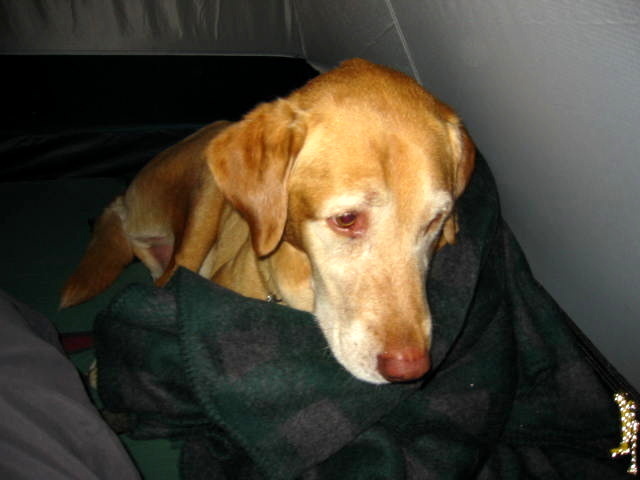 However; if you are camping in snow, you can take the snow and melt it over a campfire for both you and your dog. Just make sure that it is clean snow and hasn’t been disturbed by you or other animals in the forest. Make sure that you let your dog sleep with you in your tent if he is an inside dog and bring him his own blanket as well as some sort of cushion or pillow for him to sleep on. You want to keep his body up off the cold ground. If your dog is a dog that is use to being outside then you should bring some hay with you and make a bed for him on the ground with this. Hay is a wonderful form of insulation, make sure you have plenty of it to make a good sized bed for him. Make sure that during your camping trip that you play with your dog a lot and they the two of you take plenty of walks together. This is going to help both of you stay warm and will help keep your dog nice and limber. So go out and have a great time exploring. When camping in the cold and taking your dog on a walk with his leash, make sure that you don’t use the kind of leash you would normally use when walking him in town. These are usually shorter and they will limit your his mobility and you don’t want to do that in the cold. Instead you should use a much longer leash when you go out for walks in the cold. He needs to be able to move around freely in cold weather in order to be able to keep himself warm. One final and important note. You need to make sure that your dog has the ability to withstand cold weather before you even consider going camping in the cold winter months. If you have a large dog like a husky, they are perfect for winter camping but most of the smaller dog breeds should never be taken out on winter camp outs. For more free Dog & Puppy Information download Charles’ Free Dog & Puppy Information Series at http://www.free-canine-info.com and join thousands of other people enjoying their canine friends!